Victoria Bushrangers 166 for 3 beat Central Districts NZ 165 for 5 by seven wickets. On a placid wicket at Centurian, with short boundaries on the leg side , and a fast outfield, the captain's are clueless to the target to be set. NZ riding on a brilliant 77 of 55 by Howe, with supports from Worker 29 of 25 and Diamanti 19 of 11 set a score of 166 for the Bush Rangers to get. The Victorian team which faltered in their first meet, played to a plan. 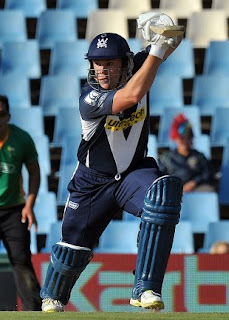 Peter Siddle getting back to the side made early inroads and finished with 2 of 30. McKay, Hastings and McGain picked a wicket each. Dirk Nannes was at his usual best in the end overs. Bushrangers had a rousing start, but lost Quiney for 15 in the fifth over for a team score of 40. Finch unbeaten on 93 of 60, was supported by Hussey and McDonald, to take the team to victory in 19.4 overs. Bracewell and Rance picked a wicket each for the Districts. The match was well contested with brilliant fielding from both the sides.